B & H Engineering, P.C. has provided construction support services to the New York City Department of Transportation for the Demolition of the East 156th Street Bridge. The project involved the dismantling and disposal of the existing bridge spanning the railroad tracks owned by the National Railroad Corporation. The bridge was comprised of three spans. 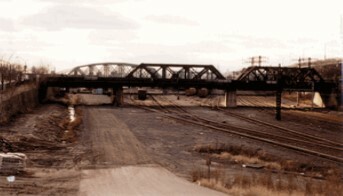 First and second spans were through trusses crossing over the railroad tracks. Third span, a girder span, crossed an unpaved road. The construction support services included the following: review of the contractor's demolition procedure, abutment reinforcement, contractor's proposed loading, protective shielding, temporary sheet piling design, and temporary structures. The project involved removal of the superstructure, and the piers to the top footing. The top portion of the abutments were removed and reconstructed with ne parapet walls and fences at street level. The approaches were constructed and new turf placed where the street leads into the bridge.